On a south facing terrace there is a covered pergola with large dining table for 8+ people. There is a further south facing covered terrace just outside the kitchen. The nearest ski station is at Gréolières les Neiges (about 1h30 from the villa), a lovely family station. There are golf courses at St. Endreol, next to the village at La Motte about 20 minutes away and at Golf Roquebrune (a challenging course) which is ten minutes further on. There are two courses at St. Maxime: Beauvallon Golf club and Sainte-Maxime golf course. At St. Raphael there is a family golf club. Outside: The delightful mature gardens are all on one level offering accessibility to small children and people of limited mobility. There is a gas barbecue, outdooor tables with seating for up to 8 people and loungers. There are south facing terraces to the dining area and the sitting room both offering shade for the height of the summer (awning for the dining area and covered pergola for the sitting room terrace). The swimming pool, with security fencing, is 8 x 4m and is for the exclusive use of the villa. There is a boule pitch for that essential game of boules and a set of boules is provided. Cleaning / Towels / Linen / Maid service: Towels (including pool towels) and one set of linen are provided and the property is cleaned before the arrival of guests. Additional cleaning or linen during the holiday can be made available at an additional cost payable on site. Other: The indoor living areas are air conditioned and open plan, and are enhanced by the outdoor terraces. We are 4 active pensioners who enjoy visiting places of interest on holiday, and Flayosc proved to be a great location. Each day of our 2-week stay was hot and sunny, so we appreciated the patio doors in both kitchen and lounge during the day, and the air-conditioning at night. Our days began with a trip to the boulangerie in Flayosc, followed by a drive to a village, or place of historic or geological importance. We would return for a late lunch on the covered verandah, chill for an hour or so, before taking to the pool for a relaxing swim. Evening meals were prepared using the gas BBQ located just outside the kitchen. Flayosc is just a 15 mins stroll, and we sampled 3 excellent restaurants in the evening, La Cigalon, La Fleur de Thym and Le Nid. The market on Monday morning is worth a visit for fresh produce, but we mainly shopped at Carrefour in Draguignan which was a 15 mins drive. The holiday would not be complete without a superb scenic drive along the Gorge du Verdon via Moustiers-Sainte-Marie, and a boat trip from Ste-Maxime to St-Tropez on Les Bateaux Verts. Why not take the 45 mins ride that visits the Bay of Canoubiers where the mega-rich reside. In summary the villa provided everything we required, and Judith could not have been more helpful and welcoming. The only challenge we faced was from the mosquitos which took a particular liking to 2 of our party. As you would expect, there was a choice of repellents available. In summary, we had a most enjoyable holiday and the villa rating is fully justified. Thank you so much for your great review. You were superb guests and I am so happy that you enjoyed your stay at La Bélugue and enjoyed all of the great places to visit. A bientôt peut être? Large pool, great outdoor areas, comfortable accommodation with all mod cons and very well equipped. Local town good and only 20 min walk. Need to drive but can reach a lot of different areas in 1hr - 1.5hr (distances not far but roads quite windy). We did Cannes, Nice, St.Tropez, Gorge du Verdon and much more. Many thanks for your review - we are delighted that you enjoyed your stay in Flayosc and appreciated all that this wonderful area has to offer. Had a great 2 weeks at La Belugue. All the facilities you could need for a great holiday. Fantastic pool which the children loved and spent hours in most days. Lovely terrace to sit on for lunch/dinner and plenty of seating areas around the Villa to avoid the sun. Nice new seating area which we used a lost in the evenings. Torn between spending time at the Villa and getting out and about and seeing some of the sights. The Village of Flayosc is only a short walk away and has a variety of shops and restaurants with a market on Monday mornings. Judith was very helpful and booked a restaurant at Chateaudouble (La Tour). Lovely scenic drive and great views from the terrace of the restaurant along with a great meal. A must is a trip to the Verdon Gorge - fantastic views but be careful if you don't like heights !!. We arranged a rafting trip on the Verdon river but you do need to book in advance. We are delighted that you had such an enjoyable holiday - Flayosc is indeed a great place to base yourself - super that you enjoyed many of the activities the area has to offer. Thank you also for being such great guests. Hope to see you again sometime. We have had a fantastic 3 weeks in this great house. We were a family of 6 including 2 young children and 2 grandparents. It had all the facilities that we could possibly need as advertised. The house is well maintained with properly sealed pvc double glazing all round. All rooms were air conditioned and this was needed as it was a hot summer. Full UK television which doesn't usually bother us however it was the World Cup this year. The stroll into town took about 20 minutes with our 5 year old which was not a problem, just take a torch for the way back as the villa road has no street lighting. The pool heating made a huge difference. We stayed somewhere else in Flayosc last year and the pool there was turning our daughters lips blue. This year both girls spent most days playing in it. The only very slight criticism is that it would be nice to get the pool professionally cleaned every week or buy a swimming pool hoover. The water was clean and a net provided (and brushes) but the pool floor got very dirty with dead ants and detritis from the trees. It took half an hour each day to try and scrape up this debris with the net and I couldn't clean up all the dirt particles with it. Judith and Keith were very helpful and friendly as was the lady who came to water the garden. I fully recommend the house and we hope to return one day for another visit to Flayosc. Thanks again Judith and Keith! Lovely quiet villa set in nice gardens with pool. Very spacious and ideal for large families although equally as good for small groups who like some space. Judith and Kieth very helpful if you need any advice or help. For convenience a gas BBQ would have been nice instead of charcoal. Pool area very good with plenty of lounges and shade if needed. A wonderful relaxing place to stay with everything you could possibly ask for. We took our 3 adult children and a boyfriend (now fiance!) on holiday. We have just returned from a week at La Beluge in blazing sunshine and soaring temperatures! The swimming pool was a wonderful resource, and very well used! The grounds of the house are perfect for these sorts of temperatures with plenty of shady areas as well as attractive poolside sunny parts. The house itself was lovely and spacious and cool with very effective and quiet air-conditioning - meaning that nights were very manageable. Judith was extremely helpful and efficient at solving minor issues for us making our stay extremely easy and relaxing. Flayosc and surrounding area was quiet and seemed fairly untouristy - would definitely recommend to anyone seeking a quiet relaxing break. On behalf of the owners many thanks for your positive review. We are delighted that you enjoyed your stay at La Bélugue and that you liked our friendly village. We'd love to see you back again. The Riviera is only a short drive away - St Maxime, St Raphael, Cannes, Antibes amongst many other Mediterranean towns and villages. Of course St Tropez is also easily accessible - but remember to take a water taxi from St Maxime in the summer months to avoid the traffic jams to this popular resort situated on a peninsula! Don't forget that there are also beaches at Lac St Croix which are much quieter and just as good if not quite as glamorous as the Côte d'Azur! 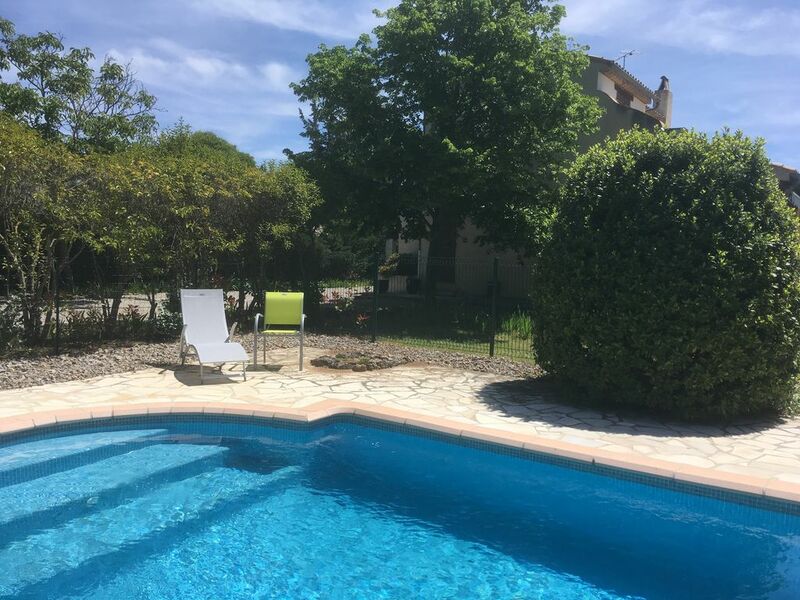 The villa is easily accessed by air (Nice 90 kms, Toulon 79kms and also Marseille), TGV train (Les Arcs-Draguignan - 15kms) and by road (Junction 36 at Le Muy, A8). Car hire is advisable if you wish to take advantage of all of the wonderful villages, the Gorges du Verdon and the coast. However, the village with a huge variety of shops and services is only 15 minutes by foot so visitors may be self sufficient without transport. The lovely village of Tourtour is 13 kms drive. Les Arcs with its lovely medieval quarter is 15 kms. The fantastic Gorges du Verdon is less than one hour away. Avignon and its famous bridge is a 2 hour drive. The village is well equipped with 2 small supermarkets, fresh fish shop, butcher, delicatessen,2 bakers, chemist, 3 doctors, a dentist, bank, post office, gift shops, 4 bars 2 of which serve food and (at last count) 8 restaurants! A famous truffle restaurant is to be found in a nearby village 15 minutes' drive away. The local town of Draguignan is only 8kms away and has large supermarkets and a variety of shops. Provençal markets are held in the local villages almost every day of the week: Monday Flayosc, Tuesday Lorgues, Wednesday Draguignan, Thursday Bargemom, Friday Le Luc en Provence, Saturday Aups and Draguignan amongst many others. Flayosc is ideally situated half way between the spectacular Gorges du Verdon and the sophisticated Mediterranean coast. From here you can easily visit Monaco, Nice, Cannes, Antibes, St Tropez, Marseille and the wonderful cities of Aix-en-Provence, Avignon and Orange are accessible too. Booking Notes: 25% deposit is required to reserve the property. Full payment is required 60 days before the letting commences. 300€ damage deposit is payable in cash on arrival. This will be refunded by internet banking within two weeks of the end of the holiday minus any deductions for breakages or excessive cleaning. Changeover Day: Changeover day is usually Saturday. Outside of the peak period of July and August this is flexible. Mid week changeovers may be possible during these months at a supplement of 100€.. Please enquire. Arrival should be after 16h00 and departure before 10h00. Notes on prices: Prices are inclusive of all utilities, cleaning before arrival and on departure and one set of linen including hand, bath and pool towels. A 25% deposit is payable upon booking and the balance due 60 days before arrival. 300€ damage deposit (refundable by bank transfer within 2 weeks of end of holiday) is payable in cash upon arrival.